Four decades after Glen Sandwith founded the company as GS Holdings, we still provide the same great service with great people that are focused on doing quality work, safely and efficiently. GS Construction is proud to be one of the longest-serving general contractors in Central Alberta. To improve the quality of life for people, families and the communities they live in. At GS, we like to think we look at things a little differently. Our first priority is finding quality people with the intelligence, work ethic and personal pride that fits with our corporate culture and values. We then spend the time training and growing our people to be World Class construction professionals. We are proud to have a “field-focused” mentality. That means we understand our people on-site are the ones who get the job done. We’ve structured our organization so that all other business functions support execution in the field. We have a set of key processes and procedures that we follow on every project to get the job done right: from the estimate, to pre-job planning, to construction planning… all the way to post-job reviews. We continually try to grow and develop our people because people are the only thing that differentiates one construction company from another. 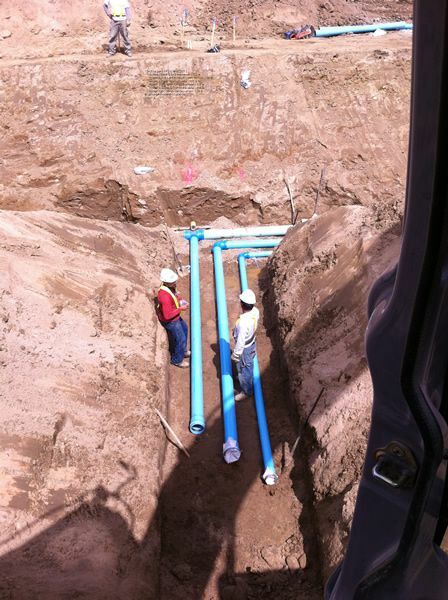 GS Construction specializes in the self-performance of water and wastewater infrastructure construction. We have acquired and sustained these clients because of our reputation for quality workmanship, honesty, and integrity. Our trusted list of Tier 1 vendors and subcontractors allows us to increase our scale and scope as required for any project while sticking to project timelines and budgets.